Description: The fairest of them all loves spending time with her little girl, testing face masks and creams can be a fun activity for the mother-daughter duo, won't you join in on the fun? Start the beauty treatments by cleaning the skin of all spots and imperfections, reshape the eyebrows so you can apply colorful makeup. 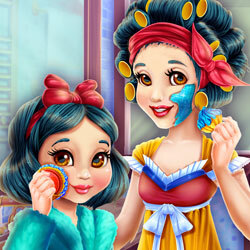 After that dress up Snow White and her cute daughter in elegant dresses and they will be ready for a playful day!